Day 3 of Inuyaki’s Momofuku Week lightens things up with a dish that has absolutely no meat in it. One of the book’s easiest recipes the Ginger Scallion Noodles. David Chang says that ginger scallion sauce is “one of the great sauces or condiments ever,” and it’s one of Momofuku’s mother sauces. The ginger scallion sauce is a simple combination of finely minced ginger, thinly sliced scallions, light soy sauce, oil, kosher salt and sherry vinegar. I couldn’t find any sherry vinegar locally so I substituted it with rice vinegar, which worked nicely. 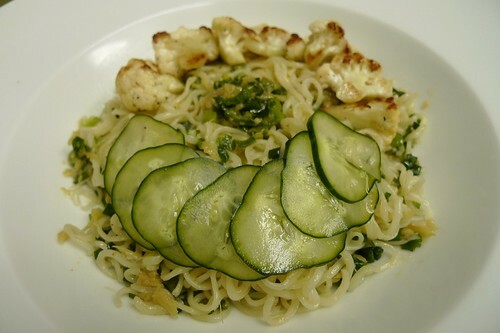 Chang says you can use this sauce on anything and encourages improvising, but I liked his suggestion of topping ramen noodles with the sauce, quick-pickled cucumbers and pan-roasted cauliflower. There’s a bunch of pickle recipes in the book, but my wife did her own version with sugar, salt, and rice vinegar to taste. You can eat this on its own or as part of a larger meal. Either way, it’s a delicious and healthy option to offset the book’s meat-centric focus. I’d second this one. I had these for lunch last week and they were deeeelish. I added broccoli. Erm.. the next day I had the exact same thing for breakfast with some of the leftover sauce, except I whisked in a tablespoon of peanut butter which also tasted exceptional. Could seriously eat this everyday. Looks like I found what to make for lunch tomorrow. Thank goodness for your website. looks tart ‘n tasty. will try tonite. OK, am I missing something? Do you eat this “sauce” raw? @ponyo yup…just mix it together and serve. I generally make it in advance keep it in the fridge so it’s cold.